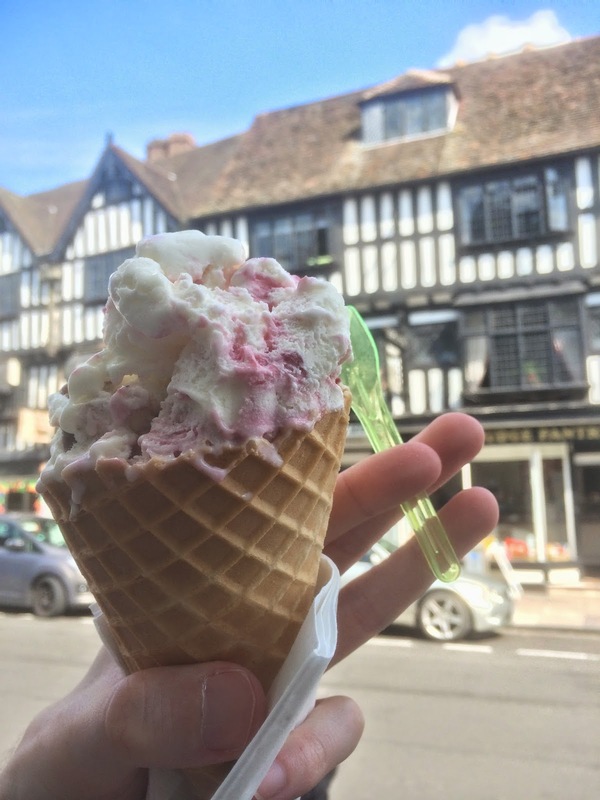 When visiting Stratford with friends (the ones from the previous crisps review) they suggested that the best ice-cream place in town was called Hooray's and was on the other side of the town centre. We walked past lots of normal ice-creams of many varieties to get to a quite large shop with a huge queue and higher prices than I'd expected. I think the queue was mostly down to the huge range of flavours on offer, as service was lightning fast and people were in constant circulation. I decided to just go with three basic flavours that went together (I discovered most people had 1 or 2 scoops afterwards) and to worry about the more exotic ones another time. I chose a three scoop cone which turned out to be a lot larger than I'd expected (so was more worth the £5.50 than I'd initially thought). I could have got a 4th scoop for only another pound, but in hindsight I think that would have been too much food! I chose a Blackcurrant cheesecake base, a cookie dough middle and on top I had a red swirly one I can't remember the name of. Like I said there were lots of varieties and the ones I thought about and the ones I ended up ordering were slightly different! I probably haven't got the names of the other two correct either. The shop was too busy to take pictures of the selection behind the counter. You can see the lovely buildings of Stratford that attract the tourists and this is really close to both the river and the Shakespeare buildings so a perfect location. The gelato itself is very rich and filling and more like a meal than a snack - especially in the volume I'd ordered. It was more like eating two ice-creams than one! Each flavour had a signature taste added to the deep vanilla gelato that underpinned all three. The red flavour had veins of fruitiness and a red gelato streak, the cookie dough as expected had tough bits and chocolate for excitement, the blackcurrant cheese cake was probably the most unusual and had the real flavour of the desert. A lot of care and time has gone into these flavours and although they are serving these all day to tourists who are unlikely to be ever back in the same place the quality didn't dip at all. No one offered to share their flavours with me so I hoarded all mine to myself too. The girls who live in Stratford often visit on hot days and their family remarked that they had different flavours every time and hadn't had a bad one yet. I think that if you treat these as a luxury pudding and not as a quick cool-me-down snack then the price is not only appropriate but is pretty good. I'm glad that we were taken here and shown the delights on offer and as we stood outside making suitably yummy noises we got to observe various international tourists making the same observations. 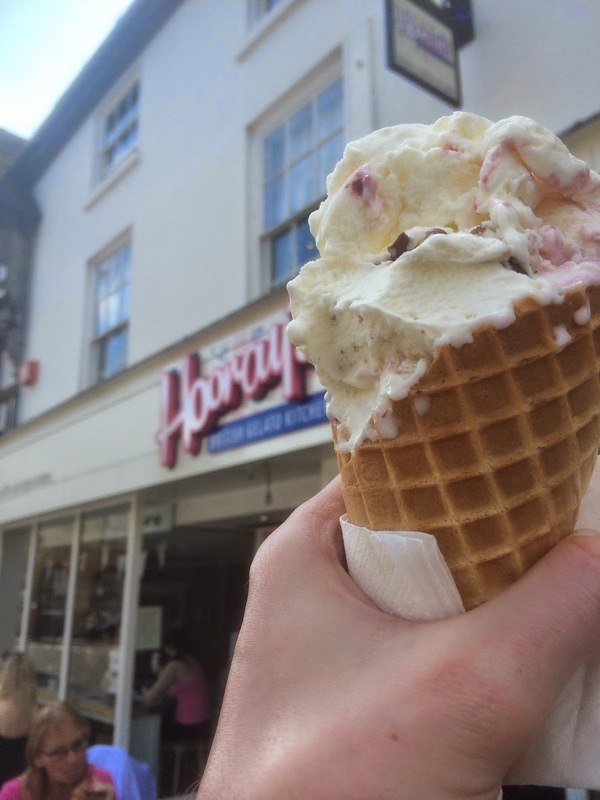 If you want to visit Hooray's Gelato then the details are here.